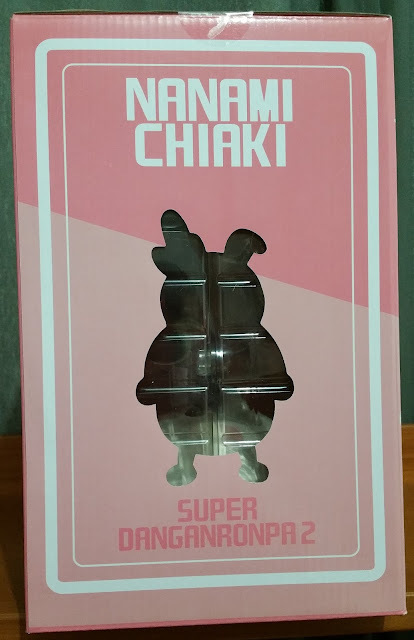 Figure Unboxing and Review: (Part I) Packaging Review + Setting up of Nanami Chiaki by Phat Company! For those of you who know this particular figure from Phat, you will know that her shipping is excruciatingly painful (only high-cost SAL or even EMS) due to her large box size and the number of accessories that she comes with. If you have read my previous post about an interview with Nanami Chiaki, or maybe if you are a fan of the franchise, you will know that she is an avid gamer. 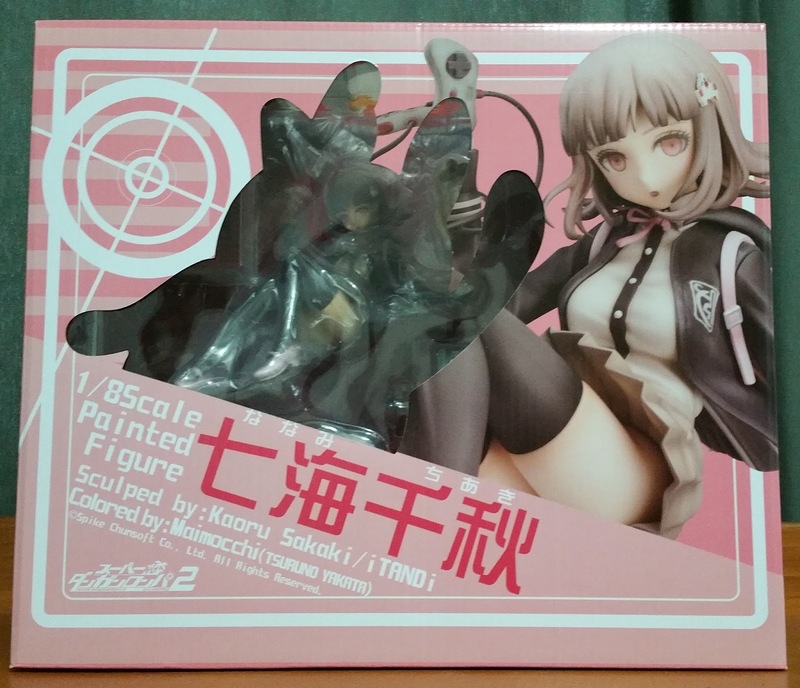 This makes it appropriate that she comes with a bunch of gaming consoles and the antagonist of the series, Monokuma. Looking back at my loot post of May 2017, I would have never expected such a huge box. In fact, this is just one of the two boxes that arrived to me from Amiami. 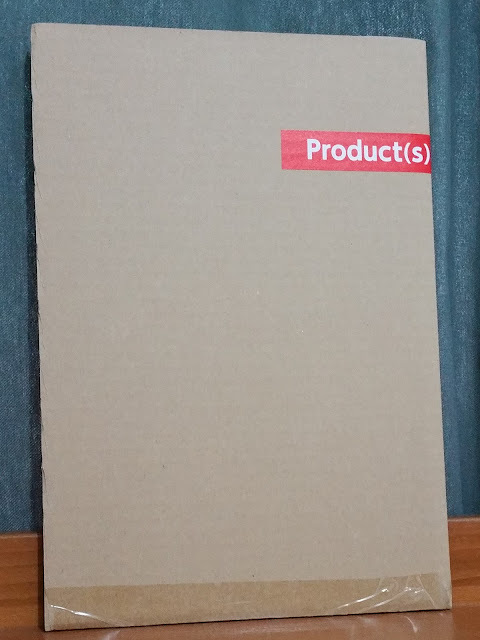 As Singapore imposes custom fees on packages that are above SGD$400 in a single shipment, I had no choice but to split my order into 2 components. The first contained Hanairogoromo Meiko and Kaito, both of which I would review shortly after completing the 3 parts of reviews for this figure. 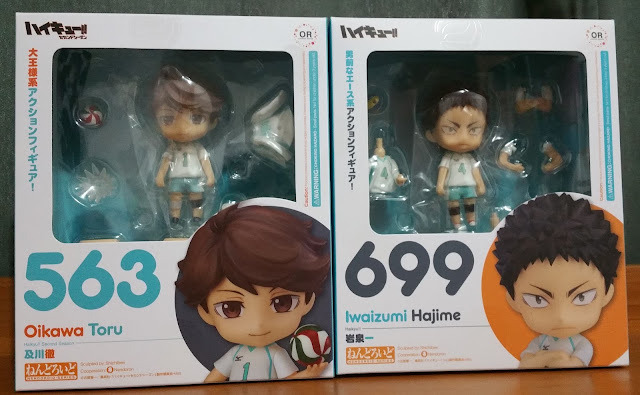 The second (containing Chiaki) came with her, a Blue Exorcist file, as well as Nendoroid Oikawa and Iwaizumi. The image above has a 10cm Nendoroid Araragi Koyomi for a size comparison. That box is definitely one of the largest I have ever gotten! 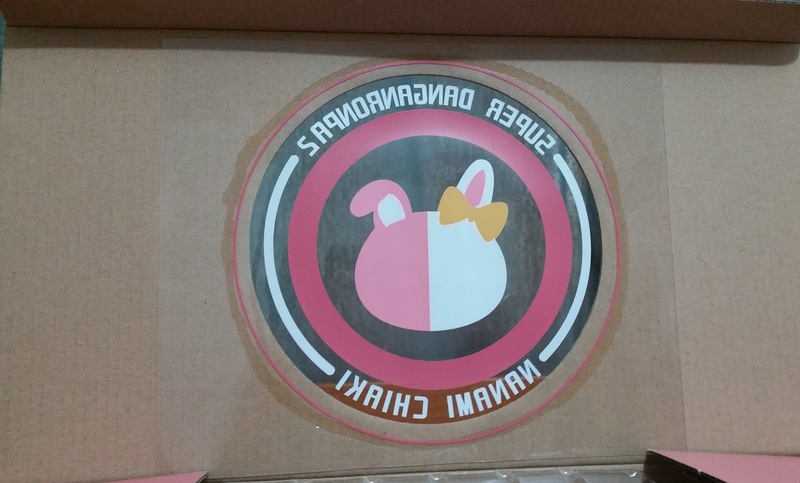 Opening the cardboard box, I was greeted by the traditional Amiami postcard as well as this cardboard book-like thing. 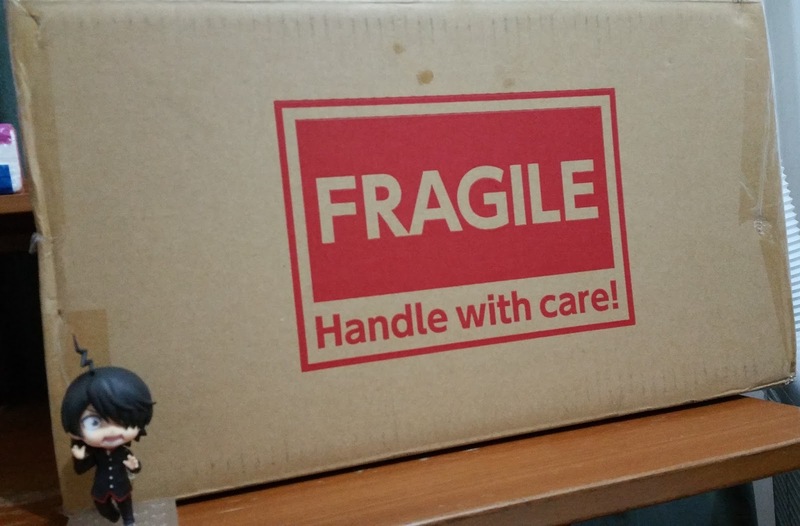 If you buy anything like files or pencil boards from Amiami, you will know that they tend to keep such things in these cardboard book-like things, which can increase shipping quite a bit but would definitely keep those files and other items save from folding and bending during transport. And sure enough, inside it is the Blue Exorcist (Ao no Exorcist) file! I love how this looks like a movie wallpaper and would even look fabulous as a wall scroll! 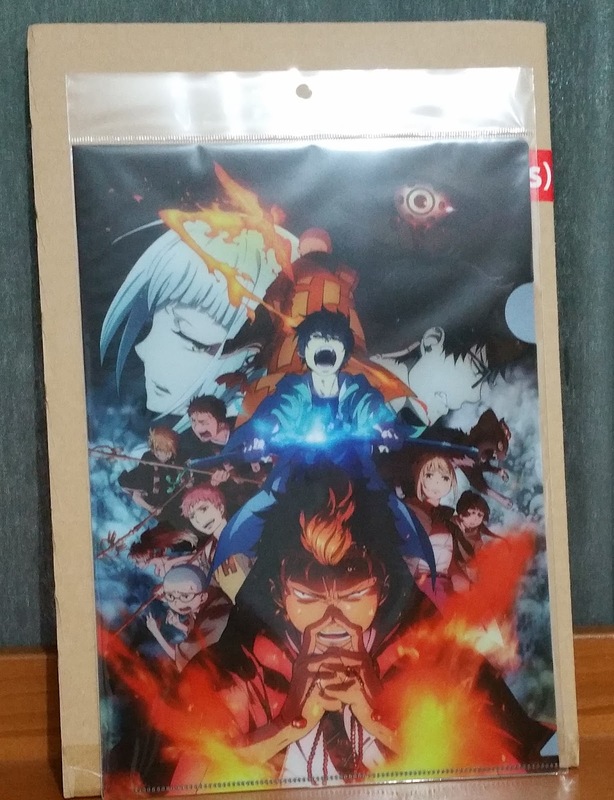 Though I have long since ceased to be an avid Blue Exorcist fan, I have once enjoyed it tremendously and I'm glad I will now have something to remember the series by. Furthermore, I blue-tack my files to my wall (which is still work in progress) and I can safely say it looks awesome there. But the review about these Nendoroids are for another day. Let's bring the main focus today back to our princess, Nanami Chiaki! 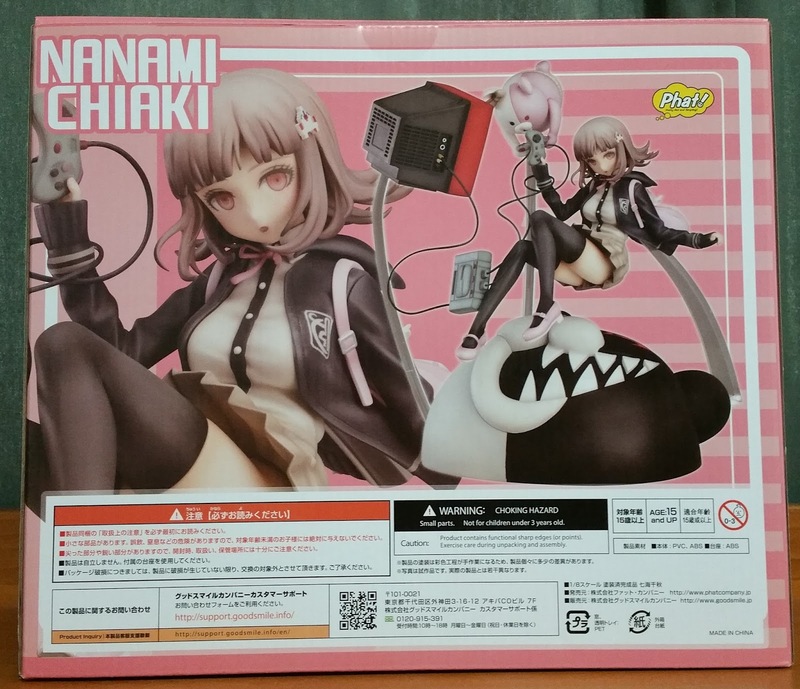 Chiaki does come with an extremely huge box and all with good reason--because she comes with too many accessories! At least this is her re-released version and I had some mental preparation for her high shipping cost after being warned by fellow collectors who pre-ordered her upon her first release. The box is made of thick corrugated cardboard which serves as a good cushion against impact. 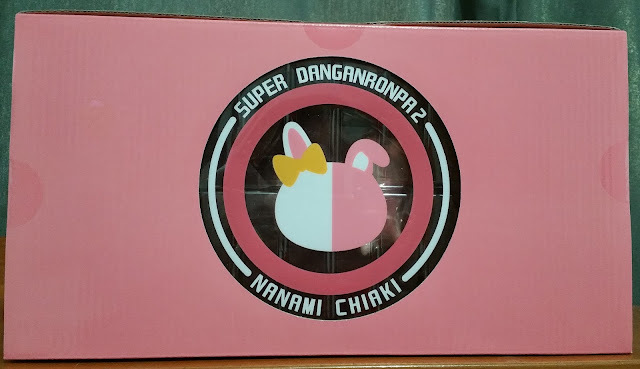 What's lovely is that the box is mainly decorated in pink (different shades of it to add depth), and that is Chiaki's image color. The soft pastel color also suits the light shades of her hair and eyes, as well as fair skin, which helps her dark-colored jacket and stockings to pop. As a fan of the games, I can safely say that the target circle thing at the top left of the image above is a very good touch. In the game, the player assess the crime scene and fine clues and then "shoot" such clues as "bullets" to "shatter" contradictory points that the other members put across. This is a little difficult to put in words but as "bullets" are such an important aspect of the game, it is only apt that they put the target circle in. 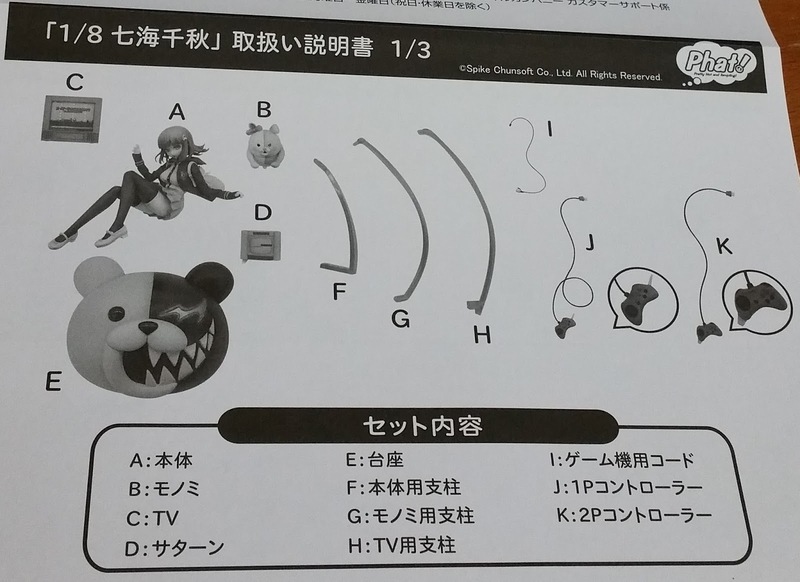 Monomi, Monokuma's sister, is included as cutouts all around the box and even as part of the figure. Apart from being terribly cute, Monomi is also a very good friend and partner to Chiaki and they were even vanquished together eventually. Continuing with the 360 view of the figure, we see her in a zoomed in and a full view of the figure, all properly assembled. Take note of this because it will be the most important reference image when you assemble the figure! Sometimes I do wish that they can show different views of Chiaki instead of simply reviewing her from her front view. Still, each image of her they show just makes me appreciate this figure more. 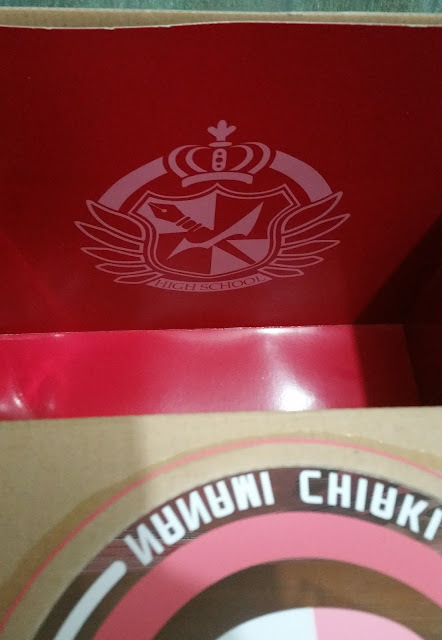 It was actually on a plastic sheet which they glued to the inside of the box... yay? Another zoom in on Monomi's cutout here~ Sometimes I think she looks like the mascot in Sekaiichi Hatsukoi, heh. The inside of the box is lined with this bright red paper which makes the inside of the box look pretty luxurious when you peer through the Monomi cut-out. They even printed the school emblem inside, which is stretched out at the back flap of the box. 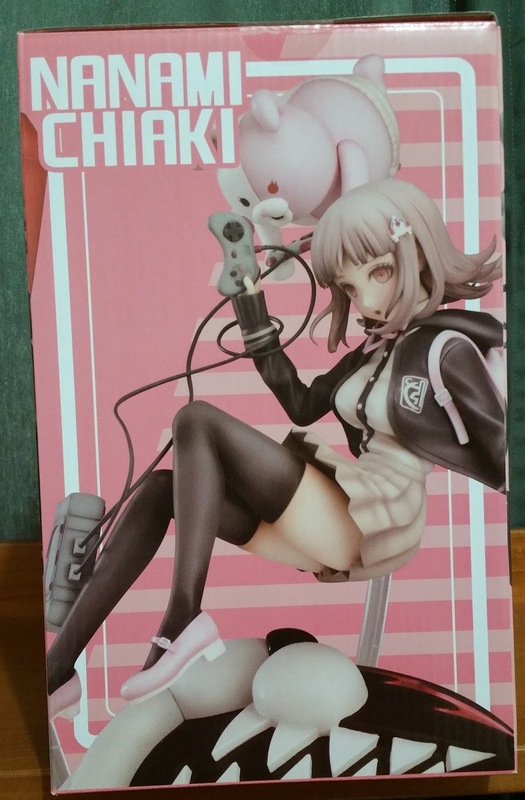 Unfortunately Chiaki usually blocks it so you can only view it if you take her out from the box. Let's get down to what she comes with. Make sure to check all the parts against the instruction sheet she comes with, especially for the stands (three different sizes) and the consoles (two different kinds). When you are done with checking all the items, let's get on to assembling her! This is the instruction sheet to describe all that you have to do. 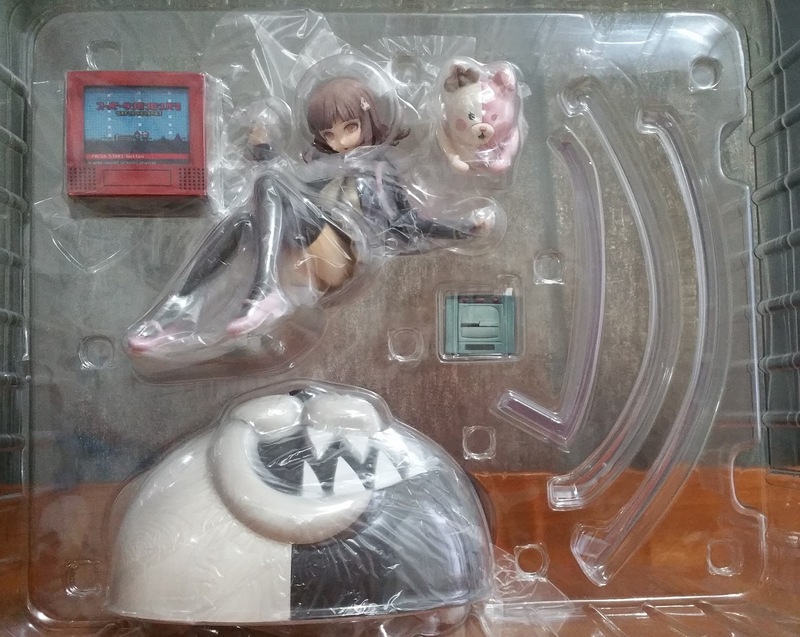 The shortest stand goes into the peg hole in Chiaki's back and that connects to Monokuma's black right ear. The moderate length stand goes into Monokuma's white left ear and connects to Monomi's foot. 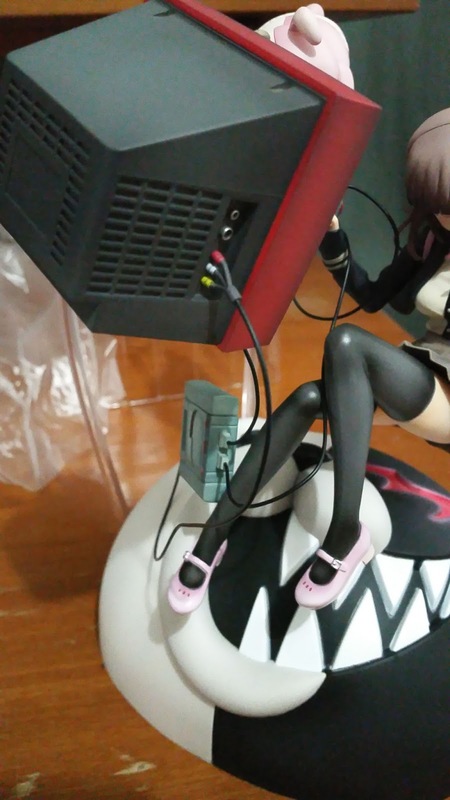 The longest stand goes into Monokuma's white cheek and connects to the TV. 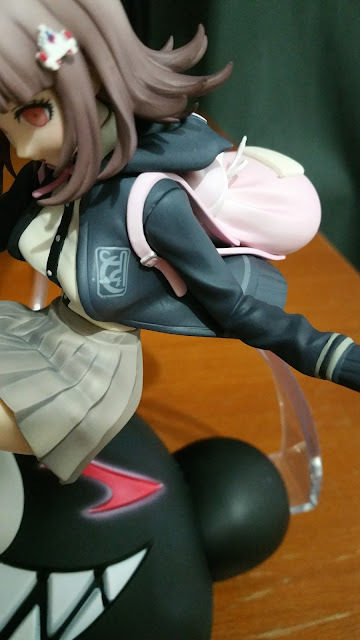 As you can see from the image above, the peg goes under Chiaki's blue jacket (or blazer). 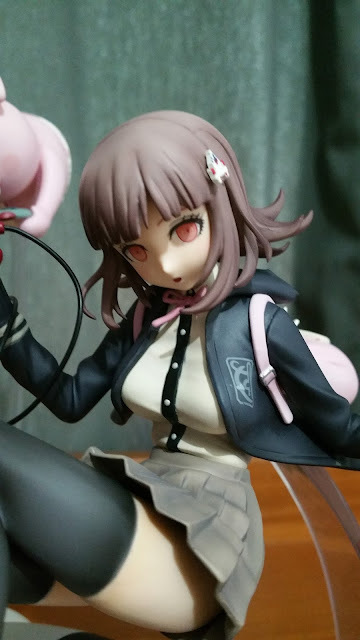 It's difficult to get the peg into Chiaki when you have it attached to Monokuma, so I highly recommend putting the end into Chiaki first, then into Monokuma. 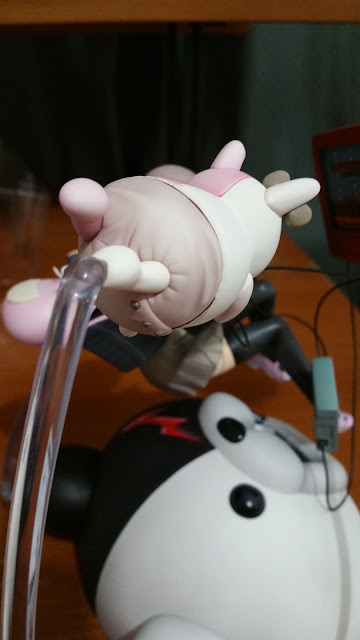 You will have to press it in with a little force to ensure that it is all the way in at Monokuma's end, that is, till the end of the hole but you might want to slowly wiggle it in instead of pushing with too much force since everything about this figure looks terribly fragile. Here is an image to show how much I pushed the stand into Monokuma's ear. 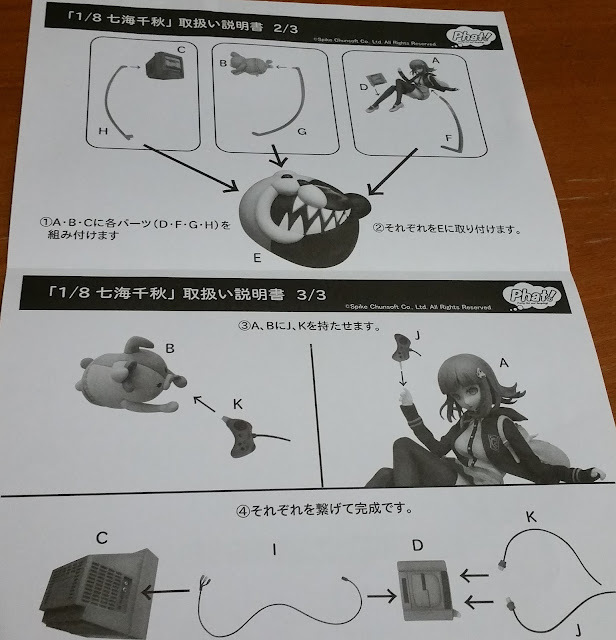 If you are unsure regarding how much to push in, always refer back to the image on the back of Chiaki's box, that would give you a rough guideline of what you will be expecting when you assemble her. 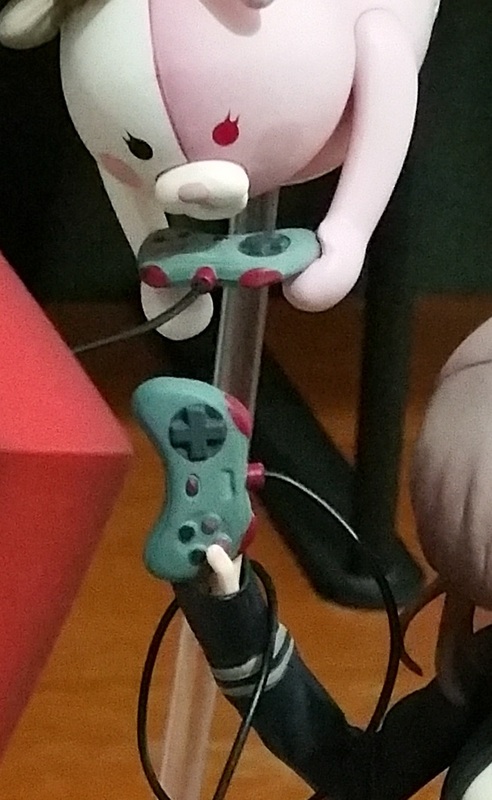 For Monomi, the stand connects to her right foot. In this case, the end of the peg has a unique shape which ensures that you will connect it in the proper orientation. 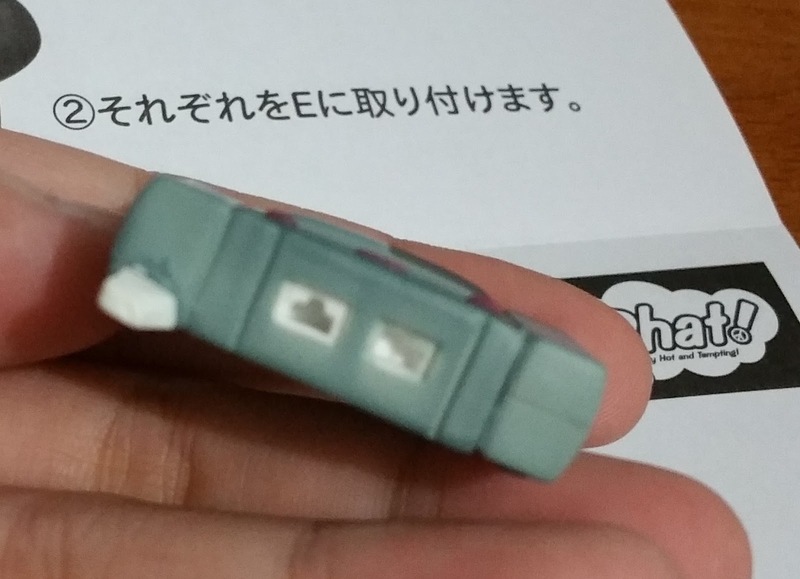 This is a relatively good thing, except that Phat doesn't do their shapes cleanly and as a collector, you may need to file a little to get the stand in. Fortunately for me, my copy of Chiaki had some problems but with a little time and lots of easing, I finally got it to fit snugly into Monomi's foot. On the other hand, for the TV, there's no unique shape whatsoever. The end of the stand is a simple circle . This helps you maneuver the TV and place it at whatever angle you are comfortable with. It gives you freedom to "customize" your figure slightly, something which I love doing. After all that, let's return to the instruction sheet again. This time, we are ready for Part 2, which are the gaming consoles (J and K), player (D) and wires (I, K and J). 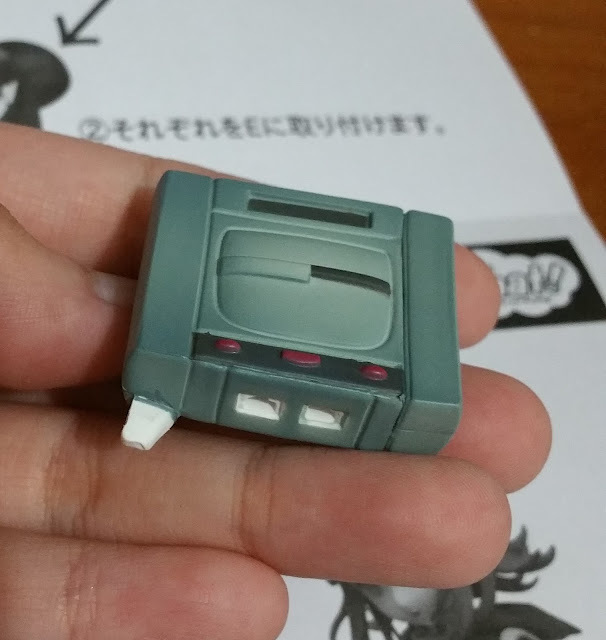 Before I begin, let me say that I loved connecting part I the most and it was the most satisfying part of the whole assembly process for me. Let's start with the player, the thing that connects all the wires. On one side of the player, you will come across this, which features a peg (the white thing sticking out of the player on the left side of the image) and two rather uniquely-shaped holes. 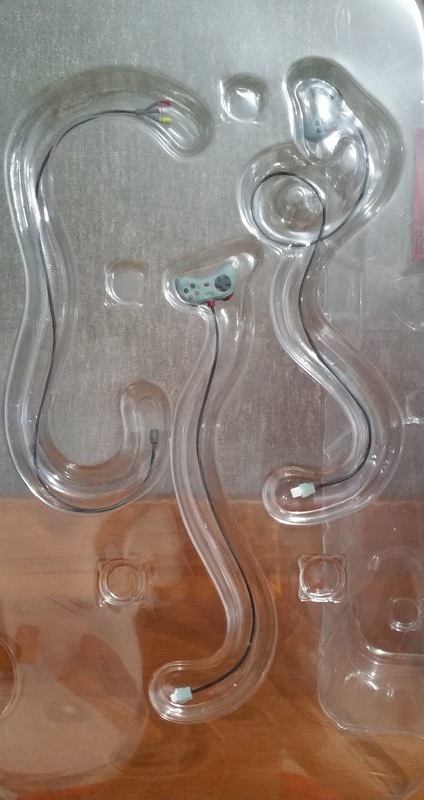 This image of the player on its side showcases the peg and holes better. 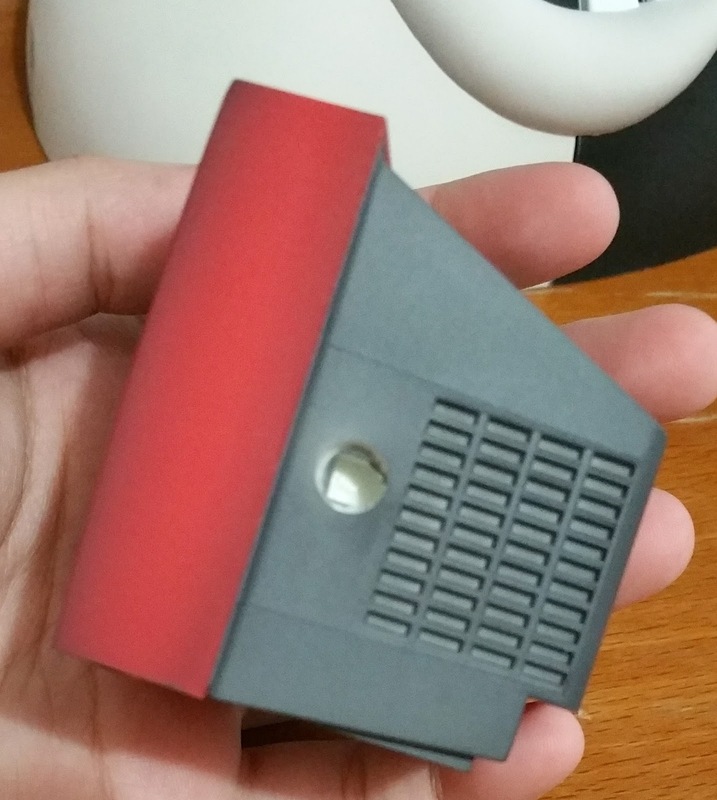 To describe what each does, wires J and K (with the gaming console on the other end) attaches into those 2 holes. If you refer back to the wires J and K, you'll see the appropriate endings of the wires to fit into these 2 holes. 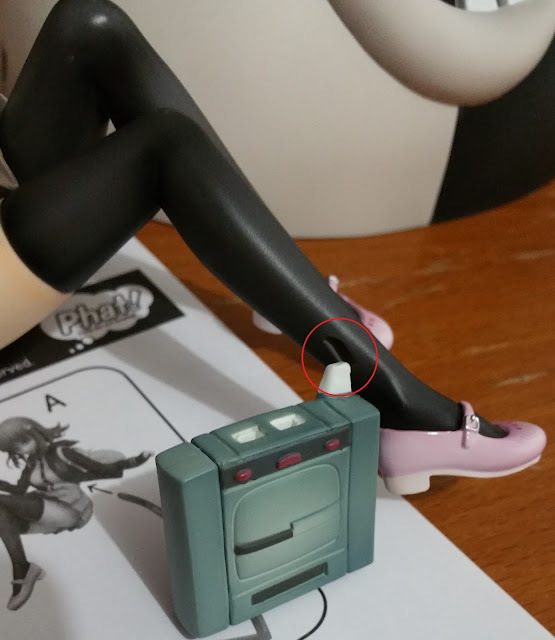 And now going back to the player, the peg itself attaches into the hole on Chiaki's leg. It's near the ankle at her right leg. I lightened the colors on the next image to make the peg hole clearer. I hope it helps. 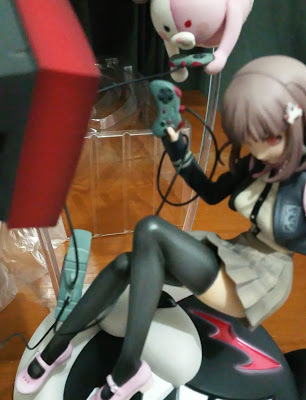 The consoles fit on Chiaki and Monomi's hands and typically come with a peg at either end of the console. 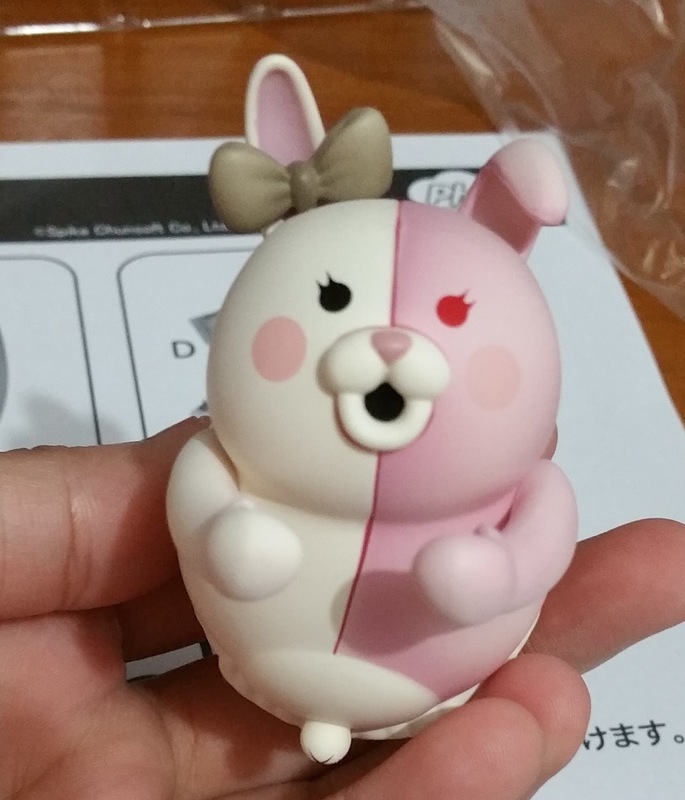 For Chiaki's the peg fits into her hand (she's holding it with only one hand), while for Monomi, the single peg fits snugly onto one hand and while there is no peg for her other hand, that hand helps to support it. At this point in time, we have almost completely assembled the figure. There is only one thing left, Part I, which is a wire that connects the player to the TV. Now, let's bring the instruction sheet back. 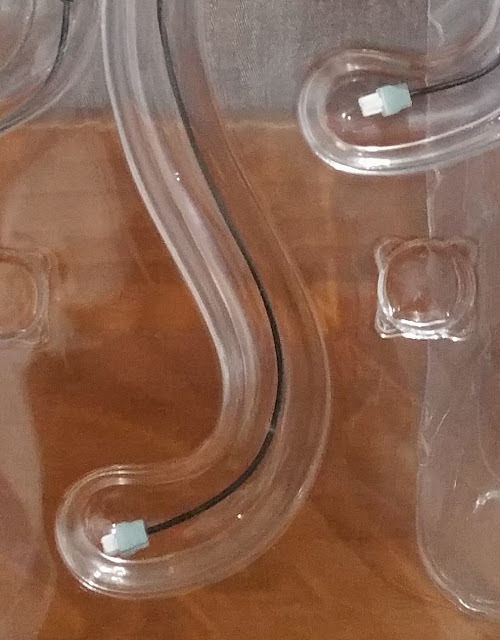 As you can see, Part I goes into a peg at the opposite end of the player from where the K and J wires connect, then end in this three-branched part that connects to the TV. First, let's find the part on the player which Part I connects to! 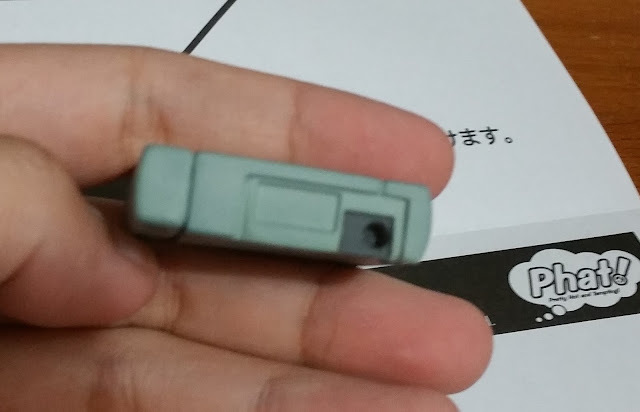 The image above is a little blurry but you can see the hole which Part I is supposed to connect to! This is one end of Part I (the bottom end of the image above) while the top three-branched end (the top end of the image above) is supposed to connect to the TV. And this is where the three-branched wires are supposed to connect--right into the three similar sized holes right beside one another. 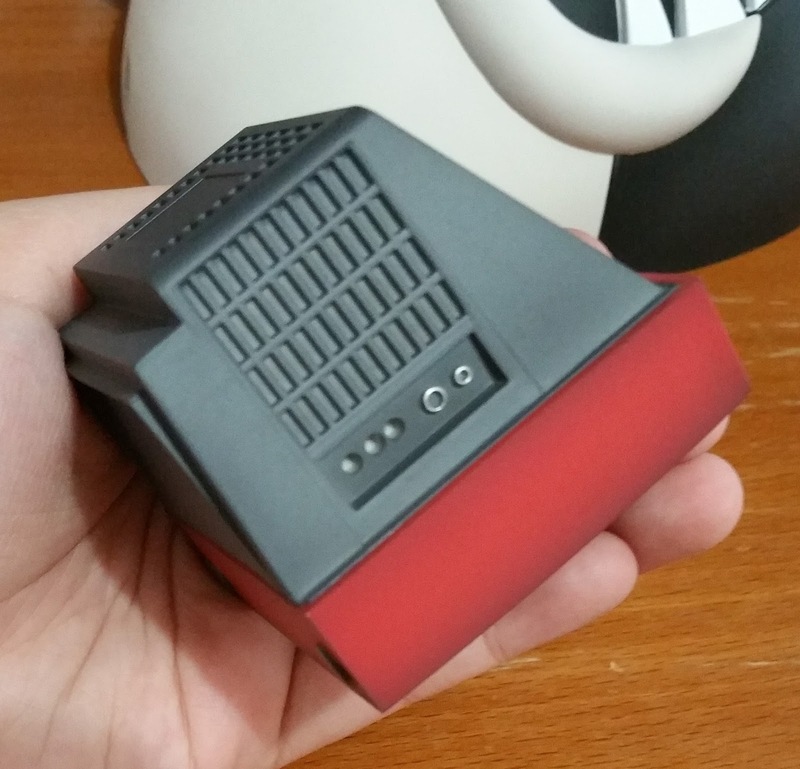 It goes in green-white-red order and you can always refer to the box once again if you are unsure of the order! In my case though, I placed it in a red-white-green order so I can see the blending of the top red with the TV better. I'm sure I will switch them around when I know what each color and plug means but for now, I'll keep it as such. A noteworthy point is that the player is connected quite loosely to Chiaki's leg and so it may drop out at various points during assembly. 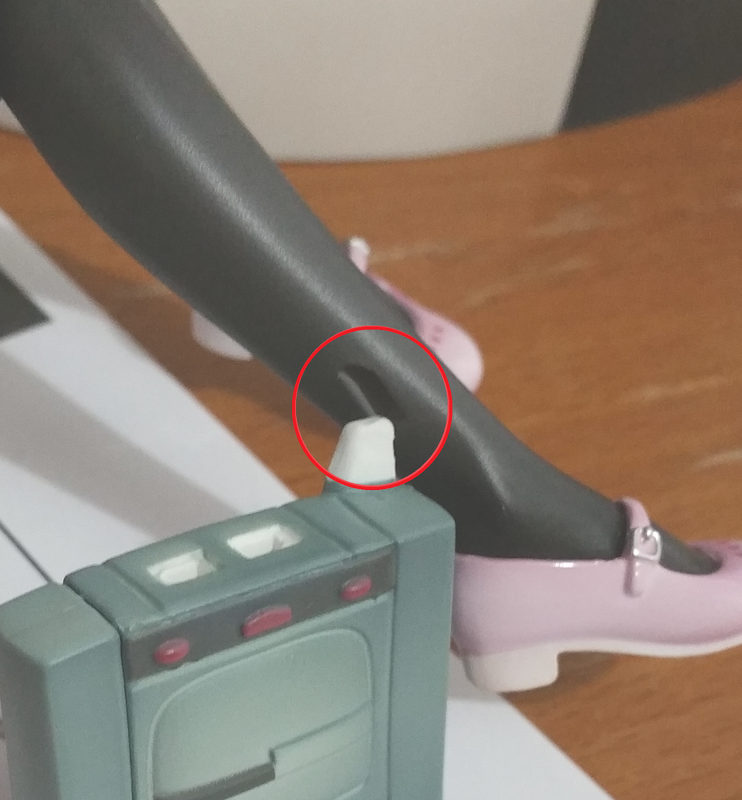 Hence if you wish to save time and reduce damage to the player by it falling and hitting any hard surfaces, you may want to only attach it to Chiaki's leg at the very end, when everything else has been assembled. No Comment to " Figure Unboxing and Review: (Part I) Packaging Review + Setting up of Nanami Chiaki by Phat Company! "